Located about 3 km from the Manila suburb of Makati, the American Military Cemetery and Memorial is a huge United States military cemetery with the graves of 17,206 American and Allied soldiers who were killed in action in the Philippines and Pacific during World War II. This cemetery is the largest American cemetery outside of the United States. The thousands of white marble crosses and stars of David stand in rank and file in witness to the epic battles of the war years. Those buried here are the war dead from the United States (16,236 personnel) and the Philippines (570 personnel). Many of these soldiers died in the Battle of Manila (1945) and the Allied recapture of the Philippines (1944-45). Others died further afield (for example, in battles between the Allies and the Japanese in Papua New Guinea). The headstones are set out in eleven large plots of beautifully-tended lawn (occupying an area of 62 hectares) inside a generally circular external perimeter. Trees, and shrubs of mostly Asian origin are planted across the landscape. There are also mahogany trees (Swietenia macrophylla). 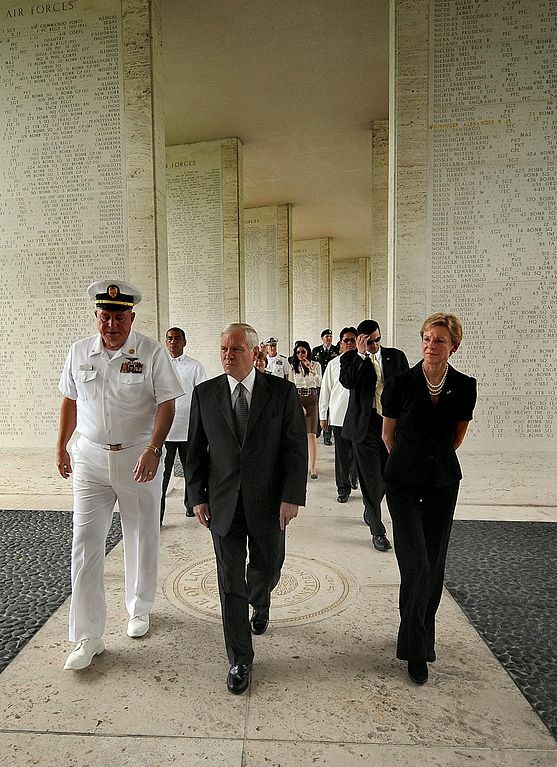 U.S. Defense Secretary Robert M. Gates receiving a tour of the Memorial in Manila's American Military Cemetery in 2009. His guide, Larry Adkison (right), is the superintendent of the Cemetery. 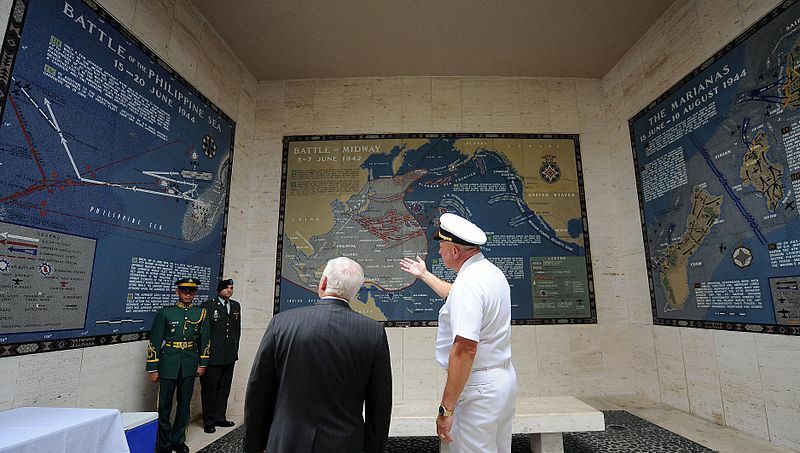 In this photo we can see three large maps: Battle of the Philippine Sea (left), Battle of Midway (center) and The Marianas (right). Photo: U.S. Air Force Master Sgt. Jerry Morrison. The cemetery contains a memorial building that contains four rooms with 25 large maps (made of mosaics), photographs and montages depicting the various battles of the United States Amed Forces in Pacific and east and south Asia during the Second World War. There is also a chapel and on granite walls the names of 36,279 American war dead whose bodies have been never recovered. U.S. Defense Secretary Robert M. Gates (center right) continues his visit to the American Military Cemetery as he walks by the graven names of the names of American war dead in the World War II battles in Philippines and the Pacific whose bodies have never been recovered. Date: 1 June 2009. Photo: U.S. Air Force Master Sgt. Jerry Morrison. On the floors are carved the seals of the various American states and territories. 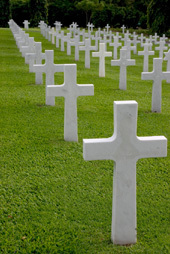 The American Military Cemetery was founded in 1948 on land given in perpetuity to the American Battle Monuments Commission whose responsibility it is to maintain the site. The Cemetery is open to the public every day of the year (except January 1 and December 25). Opening hours are from 9am to 5pm. Entrance is free. The Cemetery is located in the suburb of Fort Bonifacio (formerly an American military and now often referred to just as The Fort) and directly east of Forbes Park. Most visitors reach the Cemetery by taking a taxi from nearby Maktati. 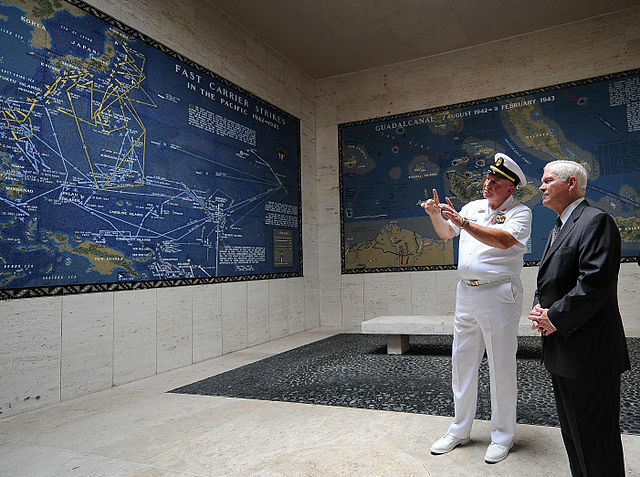 U.S. Defense Secretary Robert M. Gates (right) and Larry Adkison discuss two large maps (Fast Carrier Strikes in the Pacific and Guadacanal) in the Memorial at the American Military Cemetery, Manila, Philippines. © 2005-18 FabulousPhilippines.com. All Rights Reserved.